Things are getting even more interesting in what now seems destined to become a hostile takeover attempt of Anheuser-Busch by Belgium-based InBev. With the Wall Street Journal now reporting that A-B is expected to soon officially reject InBev’s bid for the company, arguing that it undervalues the American brewer, reports are now emerging that SABMiller has held closed talks with Mexican brewer Grupo Modelo, along with InBev. A-B, in an alleged attempt to increase its value to beyond what InBev can afford, is reportedly interested in acquiring the 50% of Modelo it doesn’t already own. InBev, in an effort to keep this from happening, has apparently approached Modelo – whose CEO has publicly stated that the brewery intends to remain “proudly Mexican” – to assure the company that should its attempt to take over A-B be successful, the Mexican company would retain all its options, including keeping the status quo, buying back A-B’s stake or selling itself to a third party, this all according to sources reported in the International Herald Tribune. To that third option, enter SABMiller, which evidently has its own interest in acquiring Modelo. Will Modelo be interested in becoming “proudly Mexican-American-British-South African”? Is A-B serious about its fight or simply bluffing in an attempt to squeeze a better price out of InBev? Is the fact that SABMiller is now nosing around mean that a competitive bid for A-B may be in the works? All this and more will be revealed in the coming weeks and months. As for how it all will affect the beer you sell and drink, well, the answer to that is probably not at all. But still, it does make for a good story. Are Tempers Flaring in Mexico? Interesting news today from the trenches of the Anheuser-Busch-InBev takeover battle. Just as the A-B board was about to meet to consider the InBev offer – a meeting which concluded this afternoon with no announcement – the head of Grupo Modelo, Carlos Fernandez, announced his immediate resignation from said board. Our most recent poll garnered a near-record of responses, and viewpoints were varied. The issue that sparked the significant response concerned the installation of roughly 100 satellite wine kiosks in Pennsylvania. The Pennsylvania Liquor Control Board has proposed setting up the kiosks at or near grocery stores and malls in the state as a way to modernize the way it sells beverage alcohol. Approximately 30 percent of respondents agreed with the PLCB that the free-standing kiosks represent a modernized, and quite convenient, way to get wine into the hands of consumers. However, the largest segment of poll respondents – nearly 35 percent – felt that wine sold in kiosks would end up in the wrong hands. This group expressed strong concern that kiosks would enable underage consumers to get access to wine, even though the PLCB has said that driver’s licenses and other forms of identification must be presented by anyone purchasing the wine at kiosks. The third and fourth groups of poll respondents were nearly tied – they received roughly 18 percent each. One of these groups agreed that selling wine via kiosks was not good, but for a different reason than the possibility of underage consumption. They felt these sales could cut into the earnings of state off-premise liquor stores. And the last segment simply felt that while the ideas was a fair one, it would likely not have much of an impact on the sale of beverage alcohol in Pennsylvania. To participate in our currently posted poll, please visit www.bevinfogroup.com. As pretty much everyone knows by now, the InBev bid for Anheuser-Busch is now official, $46.36 billion worth of official! And with the likes of the Wall Street Journal intimating that A-B’s defenses are weak, it’s worth taking a quick look at who the potential winners might be should this deal go through. So let’s start with SABMiller. That’s right, the number two brewer in the US market would gain, at least domestically and in the short term, should the number one become even bigger globally. The prime reason for this, so far as I see it, relates to Budweiser’s iconic status as a definitive American brand. So strong is the jingoistic passion with which some view this beer than an online petition to keep A-B American has already garnered some 22,000 signatures I type these words, and likely many more by the time you read them, which leaves me little doubt that there would be a revolt of A-B drinkers should a foreign company gain control of the leading American brewer. So where will Bud Light drinkers go? Likely to Coors Light or Miller Lite, never mind that the former is half and the latter fully foreign owned. And Budweiser imbibers? MGD, most probably, or High Life or perhaps PBR, the last of which is contract brewed by Miller. Granted, the greatest impact of these defections would be felt in the short term and likely mitigated over time by poor memories and boycott fatigue, but you’ve got to wonder how many in the Bud drinker ranks will stay away once they’ve found a new brand that suits them just as well. We all know about the popularity of so-called "lifestyle" drinks, which purport to add a little extra something to the thirst-quenching experience, be it vitamins, mild stimulants like caffeine or guarana, or herbs credited with near-mystic abilities like ginseng. Once a fairly isolated and fringe segment of the non-alcoholic beverage market, these things have proliferated like weeds over the past few years, and enjoyed considerable success. Now comes a new drink called DRANK, which takes the whole category to a new, and wholly ridiculous, level. Setting new standards in marketing bombast, the makers of DRANK bill it as "the world's first extreme lifestyle relaxation beverage." Okay, now I don't know about you, but when I relax there is nothing "extreme" about it. I sit back, maybe even recline, and rest -- no danger, no testing of limits and no knee and elbow pads required. So what's "extreme" about DRANK? Again according to the press release, it is "the new, go-to beverage for people looking to relax their body, mind and soul without resorting to medication or over the counter sleep aids." A laudable effect, perhaps, but not a terribly extreme one, if you ask me. In fact, it sounds like the same result I can get from an easy chair and a glass of good bourbon. •	Fuel industry experts predict gas prices should approach $4 a gallon in some markets before summer. •	Food prices rose nearly five percent in 2007, according to the U.S. Department of Agriculture. •	The largest share of disposable income on record now goes to food, fuel and medical care, according to Merrill Lynch—36 percent. •	The firm also finds aggregate mortgage debt now is larger than total home equity, with defaults and foreclosures rising. •	54 percent of restaurants reported traffic declines in January, according to the National Restaurant Association (NRA). •	59 percent of consumers surveyed expect to dine out less at full-service restaurants in the months ahead, according to Technomic, which also reports on-premise consumption dropping. Its survey of 2,500 consumers shows 42 percent ordering beverage alcohol in a bar or restaurant a year ago, compared with 31 percent in the first quarter of 2008. Now’s a good time to furrow your brow, but we’ve seen hard times before. Remember the early ’90s, when higher excise taxes and lower drunk driving BAC levels dramatically altered consumption rates? Some operators turned away from their bars and remade their concepts as family-friendly venues; several have had to invest millions to rebuild their beverage businesses in recent years, realizing beverages are crucial to the guest experience and the bottom line. Others followed the lead of spirits, wine and beer marketers to embrace the “drinking less but drinking better” mindset, setting off the shift to premium. Look at your back bar and your profit margin for the long-term results of that winning survival strategy. So, what’s the strategy today? Read Finklang’s quote again. The trick is figuring out what your guest will drink now. Some will trade down; serve them with a smile (hey, they could have stayed home). But some will seek value in drink quality, flavor or inventiveness, while others will expect it in the total dining experience, of which drinks are a crucial part. By not sacrificing quality or service while delivering on value, this industry can remain a sought-after affordable luxury. Rest assured that the pendulum will swing back; some economists anticipate the positive economic shift to begin in 2009. Will you continue to support your beverage program or find yourself working to recapture lost drink sales in 2010? “Keep it fresh.” I hear that often from restaurateurs, bar operators and beverage brand marketers. To compete today, every dining and drinking experience must have an element of the “new,” and beverage brands are constantly updating product formulations, packaging and advertising to stimulate consumer interest. We in the magazine business are no different; we’re always looking at Cheers for ways to “keep it fresh,” not to mention relevant and useful. You may already have noticed some changes in the magazine during 2008. Our Drinks department has moved, and now it is thematic; in the April issue we offer tequila cocktails, complementing our “Serious Tequila” story. A new department, “Back2Basics,” now graces the last page of the magazine, providing quick instruction on a basic best practice of bar operation. We welcome your input on the value of both these changes. Another change is the way we’re approaching profiles. In the past, we’ve presented an article about a restaurant or bar—a chain or an independent—highlighting what they do well, how they do it, and how well it is working. There’s much to be learned from examining businesses in this way. During my travels, however, readers often have told me they’d also like to learn how various operators in a market are responding to trends. Perhaps it ties into the emerging “think local, drink local” mentality. So, starting in the April issue, we’ve launched a new series called Market Profile; for April we’ve done Philadelphia. The piece looks at the drinks scene in a given market: Who are the players, what are their challenges and opportunities, what are the consumer and economic trends and, finally, what are the spirits, wine and beer traditions and trends. Why Philadelphia? We opted to look at drink markets with a lower profile than New York, San Francisco, Chicago, Las Vegas and Los Angeles to see how the trends begun in those major markets are (or are not) migrating, and also to see what’s percolating in these smaller markets that others might learn from or tap into as they seek to “keep it fresh” in their own businesses. In the Philadelphia Market Profile, you’ll meet some of the top operators, along with innovative newcomers. Again, we welcome your feedback. Also in the April issue, as part of our Cheers Beverage Conference coverage, we pay tribute to chain operators, supplier companies and up-and-coming mixologists who definitely are keeping it fresh. Bobby “G” Gleason is on the cutting edge of cocktails. Gleason has opened some of the glitziest bars and lounges in Las Vegas’ top hotels, utilizing his vast experience as a bartender and engaging way with customers. In 1989, he opened the bar at the Mirage Hotel, followed by Treasure Island and the Bellagio. But perhaps his most exciting claim to fame is setting a new Guinness World Record last year by mixing 253 different cocktails in just one hour at a competition at the Nightclub & Bar Show. Using the Hornitos portfolio of tequilas and DeKuyper’s wide array of cordials and liqueurs, Gleason smashed the previously held record of 179 cocktails in 2004. Today, Gleason holds the position of Master Mixologist at Beam Global Spirits & Wine. 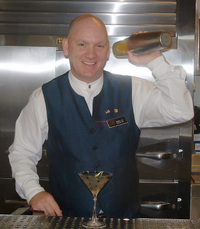 In this role, Gleason has been touring major cities, including New York, Chicago and Los Angeles, demonstrating his cocktail making expertise and offering tips as well to the trade and consumers. Here, Gleason discusses why he enjoys making cocktails, the drink he uses to train other bartenders, the latest trends in cocktailing and his fondness for the classics. The Beverage Information Group (BIG): Please outline for us a brief description of your background and experience as a bartender. Bobby “G” Gleason: I got my start as a bartender many years ago in South Florida. One place I tended bar there was at Shooters in Boynton Beach. After that, I moved to Las Vegas and opened several hotel bars and lounges. In 1989, I opened the bar at the Mirage Hotel, then the Treasure Island and the Bellagio. I also became a beverage specialist at the Rio. Today, I am busy traveling and demonstrating cocktails in my role as mixologist for Beam Global. BIG: Congrats on your record breaking cocktail making! Tell us a bit about the 253 cocktails that you prepared in 60 minutes at the Nightclub & Bar show, where you set a Guinness World Record. BIG: How did you prepare so many cocktails – basically just over four per minute – what was your secret? Gleason: It’s in the preparation. That’s an important part of a bartender’s job, the “mis en place” – having everything in place before you start. Also, through my experience, I’ve learned how to make drinks quickly. BIG: What are your favorite cocktails to prepare and why? Gleason: I love all of them, because I have a good time mixing them! The Negroni is one of my favorites. I use Campari, Plymouth Gin, and sweet vermouth. In training other bartenders, I use the Long Island Iced Tea as a demonstration. Some say it’s hard to make, but bartenders get a lesson in balance when they prepare it – balancing the five spirits and lemon sour. BIG: What trends are you seeing today in cocktails? Are Martinis still king behind the bar, and is vodka still the hottest spirit? Gleason: Virtually anything thrown into a Martini glass these days is being called a Martini. The classic Martini, however, comes from Thomas Stewart’s “Fancy Cocktails and How to Make Them,” written in 1896. It’s a mixture of Plymouth Gin, vermouth (I use Noilley Prat), and a dash of orange bitters. There has been somewhat of a resurgence in gin today, but vodka is still the number one consumed spirit in America. BIG: What about mixing trends, such as molecular mixology – is that type of thing catching on or not really? Gleason: People are getting away from molecular, it’s a fad. The important things I’m seeing behind the bar are premium and super-premium spirits and more usage of fresh juices. All of our cocktails would take a giant step forward if bartenders prepared their drinks with fresh ingredients. Also, there’s more balance of savory and spicy elements in cocktails. BIG: Is being a professional bartender a viable profession today? What advice would you give to aspiring mixologists in terms of honing their craft? Gleason: Prohibition destroyed the image of the bartender, but it has come back. It’s a great profession and today, people are making money from bartending. I’d advise novice bartenders to study the classics, as most cocktails today are variations of them. Study spirits – what they do and how to mix them. And incorporate the “drink smart” message in your work. The government standard for one drink is one-and-a-half ounces of spirit.